The parsonage (1871) has housed Trinity pastors and families for over 140 years. The present church, built on the foundation of the first brick church which was destroyed by fire in 1893. Trinity’s history as a congregation began soon after the first Norwegian immigrants arrived in this area in 1852. The spiritual needs of the settlers were cared for by traveling ministers who traveled the entire Norwegian Ridge area, as it was called at that time. Some of them were missionaries, others lay preachers, and some were circuit-riding pastors or colporteurs for the American Bible Society. The first ordained pastor of the Norwegian Synod to conduct services on Norwegian Ridge was the Rev. U. V. Koren, who had been called by what is now known as Washington Prairie Lutheran Church near Decorah, Iowa. Koren had a circuit that included six counties in northeast Iowa, and all of Fillmore and Houston counties in Minnesota. The Rev. Nils Brandt was another early preacher among the Norwegians in this area. He began work at Big Canoe in 1852, and made his first visit to Spring Grove in 1855. It was that same year that the congregation was organized by Rev. U. V. Koren at the home of Knud Knudsen Kieland, and became part of the Norwegian Synod. A year after the congregation was organized, sixty acres of land in Section 15 (about a mile and a half southwest of Spring Grove) was purchased as a “Præste Gaard,” – the “preacher’s farm” – at a price of $1.25 an acre. A large log cabin was built there and was ready for occupancy when the congregation called Pastor F. C. Clausen to serve. Three different church buildings have been built by the people of Trinity Congregation. The first was a church built of stone. This church was begun in 1860 but never completed until 1868. It was built on the land given to the congregation by Gulbrand Myrah. Gulbrand’s brother, Hans, was instrumental in the construction of this church and did a lot of the work. The second church was begun in 1876. The rapid growth of the congregation was the biggest influence in the building of this large brick church. It was of gothic design, with a steeple that rose 145 feet from the ground to the top. This church could seat 950 due to a second-floor gallery that ran along three sides of the sanctuary. This new church building burned on April 3, 1893. A fire started at a nearby implement shop, and because of a strong northwest wind, cinders and burning tar paper blew over onto the church roof causing the wood shingles to catch on fire. By morning, little remained of the church, and among the items saved from the burning building were the hand-carved pastor’s chair that stood near the altar (and which is now returned to its place by the altar) and the altar painting which was cut from its frame and carried out. Immediately after the fire the congregation made plans to rebuild. They were able to make use of the foundation and parts of the original brick walls that had not been damaged. The new church’s seating capacity was less since the second floor gallery only ran across the rear wall of the church. Also the steeple was not as tall as the steeple on the first brick church. The new church was dedicated on December 7, 1893, just eight months after the fire. This church continues to be our place of worship and we as members of the congregation of Trinity Lutheran Church attend other events during the year. The First Parsonage was built in the early 1870’s. It was a grand building when it was built and still stands as a monument to all the pastors and their families who have lived within its walls. 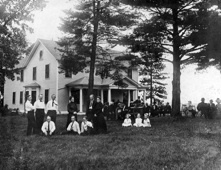 The congregation purchased a second parsonage early in the 1990’s. There have been three major cemeteries since the congregation was first organized in 1855. The first land was donated in Section 10 by Haakon Narveson. The second burial ground was located south of the Stone Church when that was standing and is now located north of our present church. West End Cemetery is the third cemetery and this is located in Section 11 across County Highway #4 from the first burial grounds.